This cotton candy maker machine is wonderfull!… The children will love it and your parties will be fantastic! This machine makes traditional or sugar-free cotton candy. Simply place sugar-free hard candy, granulated sugar, or regular hard candy into the heating chamber and in just minutes it produces wisps of feathery confection that can be collected on a chopstick, straw, or the two included reusable plastic cones. The translucent, plastic bowl allows users to watch each batch of carnival-worthy cotton candy being spun. 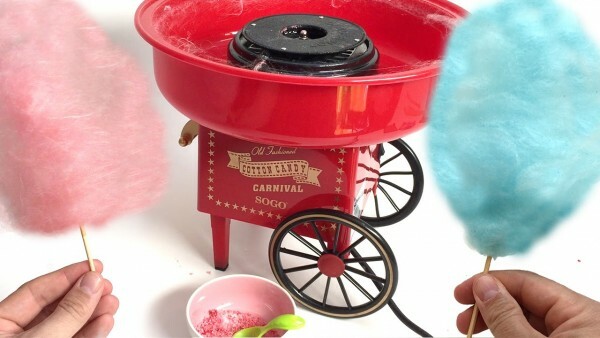 Its one-button operation enables children to participate in the cotton candy production with the assistance of an adult. The unit disassembles for easy cleaning.